Females: You must use a total of half of your bodyweight (in lbs) with dumbbells . For example, someone who weighs 140 lbs, would use 35 lb dumbbells in each hand. 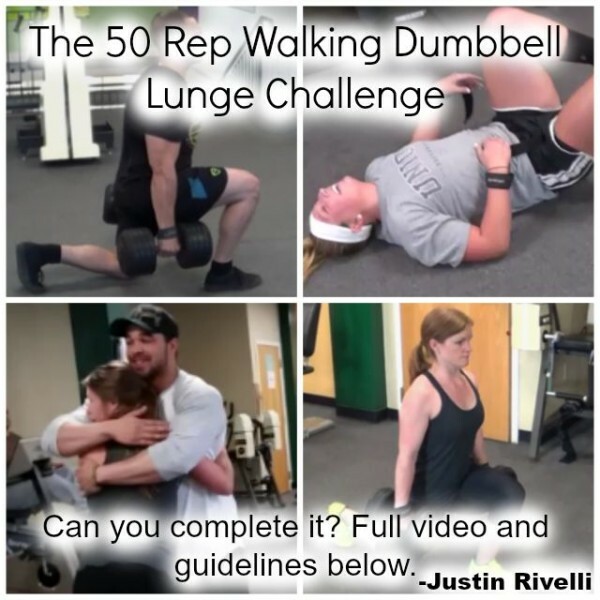 Males: You must use a total of 70% of your bodyweight (in lbs) with dumbbells . For example, someone who weighs 185 lbs, would use 65 lb dumbbells in each hand. You will be disqualified if you drop the dumbbells, and/or fall over. You can rest as long as you want, however the weights must stay in your hands, and you must remain standing on two feet. Your back knee has to make contact with the ground with each step, otherwise the rep doesn’t count. You can “step too” or “step through” when lunging. The stride length of each step doesn’t matter. You can use a short, moderate or long step. If you’re willing and able, try this yourself and let me know how you did in the comments sections on my Facebook page. I hope you liked the video, and thanks for watching! Previous: Should You Follow a Strict Diet For Long Term Body Fat Reduction?